Dubbed the “Taste of Ulster”, Thursday morning’s Kingston Community Radio show starts off with a tribute to the late Walter Maxwell. Hosts former Legislature Chairman Fred Wadnola and chef extraordinaire Cynthia Wadnola welcome Steve Aaron, Founder and Managing Member of Birchez Associates LLC. Listen in on a wide-ranging discussion, featuring the latest Birchez community in Schoharie and what’s on the drawing board for proposed affordable senior housing in the Hudson Valley. Live, Laugh and Learn, put on by the Ulster County Office for the Aging, invites Seniors to a day in a college setting at the SUNY Ulster campus in Kingston NY. Twenty-eight workshops ranged from serious (legal issues, insurance and avoiding scams) to exercise (Silver Sneakers, Tai Chi, Swing Dance, Laugh Yoga and Zumba) to fun hobbies (crafts, gardening). Monkey Joe’s provided breakfast treats and MVM-Home supplied nutritious wraps for lunch. 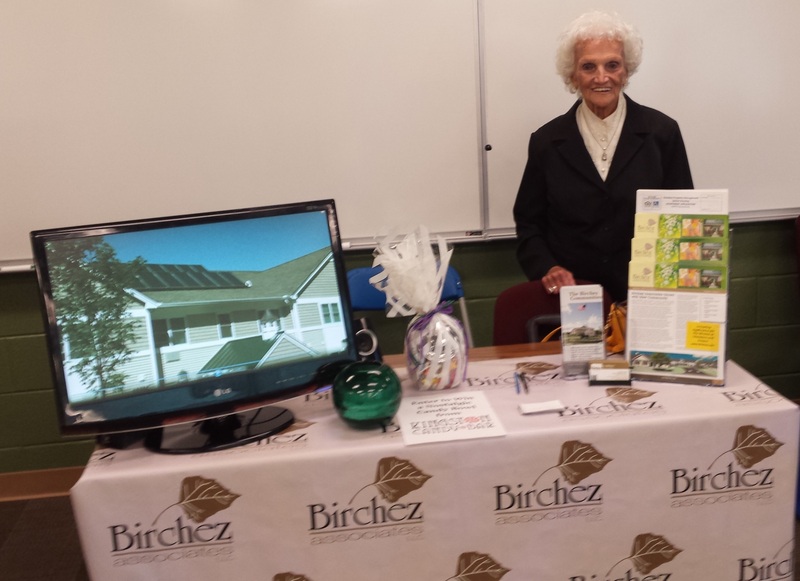 Birchez Associates represented with a booth staffed by Senior Advocate Alice Tipp, along with K.J. McIntyre and Megan Donahue of the Marketing team. Congratulations to our raffle winner at the Live, Laugh, and Learn senior day event . 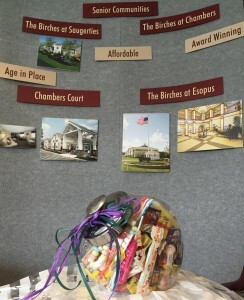 The winner is Betty Ferracane of Saugerties who won the nostalgic penny-candy jar from Kingston Candy Bar! 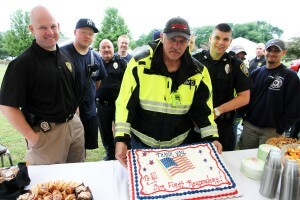 First Responders Take the Cake! 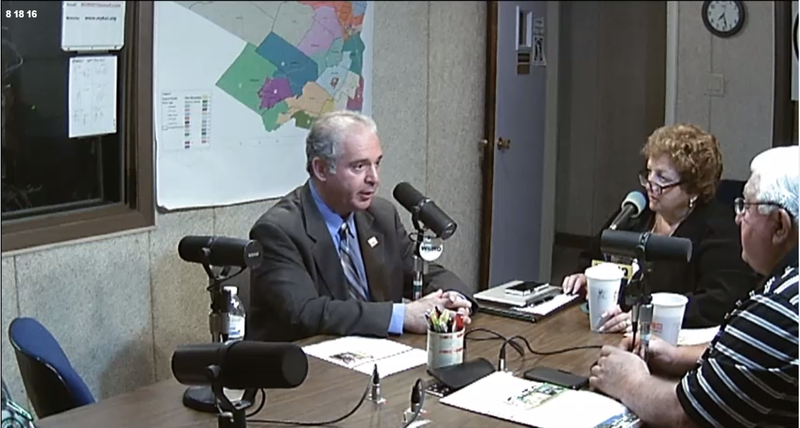 Sheriff Paul Van Blarcum is flanked by Lou Kirschner, former Treasurer for Ulster County, and Steve Aaron, Founder & Managing Member of Birchez Associates. The Salutes to First Responders, hosted by the Birches Communities, are an opportunity for residents to express their gratitude for the service that our dedicated First Responders provide. A tradition begun at The Birches at Esopus, residents prepare favorite dishes and create a delicious celebration, filling four ten foot tables of buffet items at the most recent event. Legislator Carl Belfiglio presents the Pride of Ulster County award to the NY State Police. Starring at The Birches at Esopus event were members from the New York State Police, Ulster County Sheriff’s Department featuring Sheriff P.J. Van Blarcum, the Town of Esopus Volunteer Ambulance Squad (TEVAS), the Port Ewen Fire Department and the Esopus Fire Department. The community gave the First Responders a standing ovation. James Maloney, Vice Chairman of the Ulster County Legislature, presented Pride of Ulster County awards to those celebrated at June’s Salute, hosted by residents of Chambers Court and The Birches at Chambers. Certificates of Appreciation were presented by Senior Advocate Alice Tipp and Community Outreach Coordinator Shirley Whitlock. Honorees included the Ulster County Sheriff’s Office, the town of Ulster Police, Ulster Hose Co. #5, and Mobile Life.“The Birchez residents and community wanted to do something for these dedicated men and women to show our appreciation for their service to our community,” Birchez Associates Founder Steven L. Aaron said. Dedication was definitely the word of the day: the skies opened with an unexpected deluge just minutes before the ceremony began, but both residents and honored guests showed up to fill two large tents. And Mobile Life’s Jason Whitaker and Grace Aguilar showed their dedication in true First Responders style: the team had been at the community at 11:30pm the night before, but came back off shift for the Salute. 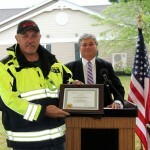 To see the related video to the June event click on Salute to First Responders. As the use of alternative energy proliferates, local fire department officials have identified a number of areas of concern with hazard mitigation and emergency response. This includes solar power systems, which are introducing new and unexpected hazards to Ulster County firefighters and other emergency responders. Ulster BOCES, Ulster Hose No. 5, Birchez Associates and Rondout Property Management have teamed up to create a class experience for all of our local fire companies. “This is part of our ongoing support of our First Responders. In helping them we ultimately help our residents,” said Steve Aaron, Founder & Managing Member of Birchez Associates. Last May, Birchez opened its doors to a class of 55 firefighters and their instructors to learn/explore the proper ways to handle any emergencies when it comes to sustainable systems. The class exercise allowed onsite experience and information for firefighters and first responders to assist in their decisions for handling fire incidents in buildings equipped with solar power systems. Specifically, this class exercise focused on structural firefighting in buildings and structures involving solar power systems utilizing solar panels that generate thermal and/or electrical energy, with a particular focus on solar photovoltaic panels used for electric power generation. Click on the title for Birchez Associates Commitment to Sustainability video to learn more about our use of alternative energy. Birchez Associates LLC Founder Steven L. Aaron presented a Birchwood Village Scholarship Award to Birchwood Village resident Angelina Lyman to support her efforts to attend Hudson Valley Community College. Lyman received her associate’s degree in science from Ulster County Community College (UCCC) in 2015. In the fall, she began attending Hudson Valley Community College in Troy where she is studying mortuary science to receive a second associate’s degree. Her goal is to graduate in three semesters and become a New York State-licensed funeral director. The scholarship award – given to Birchwood Village residents furthering their education – was for $3,600. Birchez has since given Lyman additional money for books and other school-related expenses. Lyman had been attending UCCC and was just months away from completing her associate’s degree when her 3-year-old daughter, Annabella, was diagnosed with a rare, aggressive form of pediatric cancer – stage 4 neuroblastoma. “I had to make the heartbreaking decision to withdraw from my classes and the college to fight with everything I had in me to save my daughter,” she said. After eight rounds of chemotherapy and three surgeries, Annabella was in remission. Once Annabella attained a year’s remission, Lyman returned to Ulster County Community College. Lyman made the dean’s list and graduated with a 3.47 grade-point average from UCCC. She now commutes to Hudson Valley Community College. “Becoming a mortician/funeral director has been a dream of mine since I was a child,” Lyman said. “This scholarship allows me to continue my education while relieving a ton of financial stress. I can’t thank Birchez Associates and Steve and Judy Aaron enough for their generosity to both me and my family. For information on the Birchez Foundation, go to www.Birchez.com. Elegant, affordable, senior housing is coming to Schoharie. Birchez Associates, LLC, Founder Steven L. Aaron anticipates The Birches at Schoharie community to be available for residents by late summer. On Main Street, near Schoharie’s Central Business District, Birchez is constructing 72 apartments: 60 one-bedroom and 12 two-bedroom apartments. Floor plans for the cottages and first-floor apartments of the main building include an outdoor patio/deck, while second-floor apartments will benefit from a balcony/deck. Also located at the rear of the garden-style building will be gardening plots with raised beds, and a landscaped recreation area for resident gatherings. The state-of-the-art senior living community campus will be a smoke free, and the well-appointed apartments will include air conditioning and 24-hour maintenance. Attention to detail is evident from the location of the light switches to the height of the countertops – all designed with the senior and frail senior in mind. Also, there will be plenty of closet and onsite storage space. Amenities include onsite laundry facilities, crafts/game room, computer center and a spacious community room complete with a kitchen facility. Each apartment will be outfitted with the latest in energy efficient appliances, radiant heat and air conditioning. The community will meet LEED green building-design standards, including Energy Star components that use 20 percent to 30 percent less energy than New York State requirements. Residents will have the confidence of onsite management and security. Every unit will be handicapped accessible and include state-of-the-art e-call systems in bedrooms and bathrooms, that directly notify first responders and onsite staff. “Schoharie will experience many of the same amenities and details that are featured in our other communities,”Aaron said. “This level of quality makes a difference in the lives of all our residents.” Residents will have easy access to shopping, banking, a library, medical offices, dining and entertainment in the surrounding area. They will also have available at-home care from Bassett Health Care Network. Construction of The Birches at Schoharie has created a positive economic impact on the local community. The project has a $10 million-plus construction value, creating 110 jobs and $2.78 million in wages and salaries during construction and a $1.24 million ripple effect of annual spending income from local wages and salaries during operation. “In addition to the creation of local construction and permanent jobs, this community is more about bringing a wonderful, affordable living environment to seniors in the Schoharie region,” Aaron said. For an application to The Birches at Schoharie or any of our communities, email JBower@Birchez.com, go to www.Birchez.com or call 845-338-6173. The senior residents of The Birches at Chambers and Chambers Court hosted a brunch to show appreciation for the dedicated First Responders who care for their communities. First Responders Celebrated: Some of the First Responders honored by the residents of The Birches at Chambers and Chambers Court, Town of Ulster, gather for an official pose. Joining them are guests County Legislator Peter Loughran, Town of Ulster Board Member John Morrow, Community Outreach Coordinator Reverend Shirley Whitlock, Senior Advocate (and former Legislator) Alice Tipp, Vice Chairman of the Ulster County Legislature James Maloney, Judy Aaron, and Steve Aaron, Founder and Managing Director of Birchez Associates. Town of ULSTER – The senior residents of The Birches of Chambers and Chambers Court hosted a brunch this past Saturday to show appreciation for the dedicated First Responders who care for their communities. Honorees included members of the Ulster County Sheriff’s Office, Town of Ulster Police Department, Ulster Hose Fire Department #5 and Mobile Life. Senior Advocate for the Birches Communities and former Ulster County legislator Alice Tipp offered her own experience as an example of the responsiveness of First Responders. “I took a silly fall at one of my weekly resident teas. You’d think I would be more coordinated at my age. Within minutes, Mobile Life was at my side to transport me to the hospital.” Alice was back on her post after care and, at age 93, continues her advocacy for senior residents. In addition to the emergency call units, Birchez Associates has installed defibrillator stations (AED) at the properties and has provided staff training, as a proactive measure until the first responders arrive. Birchez Associates, LLC, was founded by Steven L. Aaron in 2002 to develop and construct quality affordable housing for senior citizens, frail elderly, working families, veterans and single parents. Birchez Associates, LLC has since sponsored hundreds of affordable housing units in the Hudson Valley, generating over $60 million of development and construction in the region with well over $100 million coming in the near future. 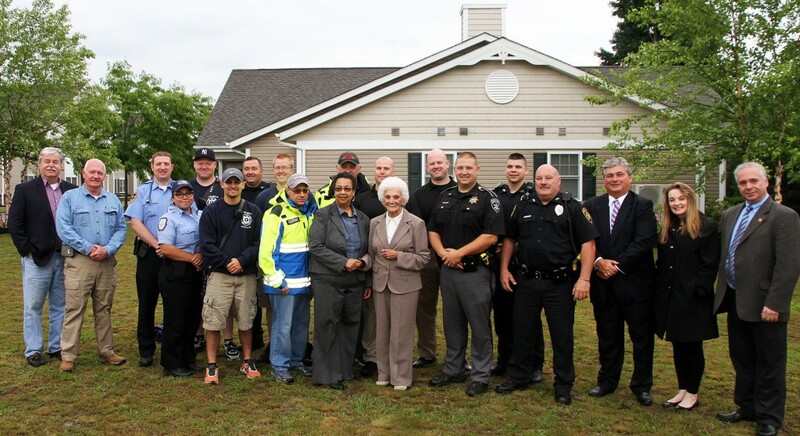 Source: MidHudsonNews.com 6/14/16 TOWN OF ULSTER – Senior residents of The Birches of Chambers and Chambers Court this past weekend hosted area first responders as a “thank you” for their continued service. Ulster County Legislator James Maloney presented Pride of Ulster awards to the first responders. Honorees included members of the Ulster County Sheriff’s Office, Town of Ulster Police, Ulster Hose Fire Department #5 and Mobile Life Support Ambulance Service. In addition to emergency call units, Birchez Associates has installed defibrillator stations at the properties and has provided staff training to assist until first responders arrive during emergencies. KINGSTON, N.Y. (March 11, 2016) – Birchez Associates, LLC, Founder and Managing Partner Steven L. Aaron has named an advisory board that will help the company choose recipients and determine the allocations of grant money for the Birchez Foundation. Maurice Hinchey – Maurice Hinchey’s 38 years of public service has earned him a reputation as “the environmental hero of the Hudson Valley,” and as a tireless advocate for working people everywhere. He is a pioneering voice in the environmental and human rights movements, author of many of the first state and national laws protecting our water, air, land and food, and was an early advocate for family farms. Born in New York City’s Greenwich Village and raised in Saugerties, he is known as an ardent supporter of affordable housing and aging in place communities, a champion of the middle class, and a dedicated fighter for women’s rights, renewable energy sources and economic fairness. A progressive Democrat who attracted equal numbers of Republican and Independent supporters, Maurice represented New York’s 22nd Congressional District, which spans eight counties from the Hudson Valley to the Finger Lakes region. While in the Assembly, Maurice developed a wide reputation for his extensive, local constituent work, believing his office should do all it could to help community members successfully navigate state agencies, and assist with government-related problems. He continued the unprecedented effort through his Congressional years. His office’s constituent services program continues to be a model for elected officials. Early in his first year in the U.S. House of Representatives, Maurice initiated and led the successful effort to preserve Sterling Forest, the last significant area of open space in the New York metropolitan region and an important watershed for southeastern New York and northern New Jersey. He was the author of legislation that created the Hudson River Valley National Heritage Area, the first federal action formally recognizing the fundamentally significant role the people of the Hudson Valley played in the early development of America. Coupled with his earlier success in enacting the Hudson River Greenway, Maurice remains an active advocate for the Hudson River and surrounding communities. Al Spada – The former Ulster County clerk who has the distinction of being the longest serving county clerk in Ulster County since George Clinton held the position in the late 18th Century. Spada received numerous honors over the years including the Lifetime Achievement Award from the New York State Association of County Clerks and the Man of the Year Award from the local chapter of the Veterans of Foreign Wars. He served on the boards of Benedictine and Kingston hospitals, the New York State Advisory Board of Public Works and the Kingston Housing Authority (also served as chairman). Spada also served on the Heritage Advisory Committee, the New York State Sports Authority and Ulster County United Way. In 2015, Congregation Agudas Achim synagogue awarded him its Humanitarian Award. Barbara Gutzler – Independent retail business manager; former Town of Wappingers Falls supervisor 2011-2016; Dutchess County legislator; West Park Union Free School District special education teacher. As supervisor, she was known for her ability to keep taxes down without cutting services and was a lead player in negotiating a deal that brought water from New York City to parts of the town that had not previously had it. She also served as president of the Dutchess County Association of Supervisors and Mayors. John V. Forman – Dutchess County legislator 2002-2005, 2008-2013, 2015-present; Fire Districts of New York Mutual Insurance Company marketing representative. 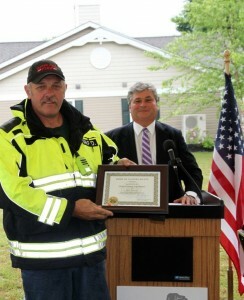 He has spent many years volunteering in local organizations that include: a 25-year member with the W.H. Mase Hook & Ladder Fire Company, an honorary-life member with the Lewis Tompkins Hose Fire Company, a former director of the city of Beacon Little League, a member of the Knights of Columbus and a former board vice president for the Beacon Housing Authority. Marlow Dunham – Pastor, Change Point Church, Poughkeepsie, for nearly three decades, first under the banner of the Hopewell Christian Center and then later as The River Church. He has led a multitude of successful outreach projects to people of all walks of life and is especially known for his visionary skills and his ability to accept, embrace and meet the spiritual and temporal needs of people from all walks of life. Larry Kithcart – Ulster County Community Action Commission (UCCAC) executive director 1982-2012 (and currently UCCAC interim executive director), former Ulster County legislator 1969-1988. A pillar of the Kingston and Ulster County communities, he continues to help those in need. In his role with UCCAC he managed programs like Head Start, to help disadvantaged children, and heating/weatherization programs for the poor. During his legislative tenure he served on many county committees, including Budget and Operations, Labor Relations and Programs for the Aging. His work helped produce “spin off” organizations such as Resource Center for Accessible Living. Leslie Price – The Village of Schoharie clerk/treasurer since 2005, who is also the owner of the J. Lacy Unisex Salon, which has been in business in the village since 1979. Price took great care to ensure village offices never closed after they were destroyed by Hurricane Irene in 2011. She oversaw the offices’ relocation two times before their current move into the town hall. The Birchez Foundation, created in 2014, awards grants to further assist organizations that provide services to assist senior citizens and U.S. military veterans, or support educational programming and preserve or improve the environment. Birchez Associates has often supported many worthy community causes and events in the communities that it serves, such as providing educational scholarships; distributing turkeys, toys and clothing during the holidays; and improving the lives of their residents. The Foundation’s goals are consistent in keeping with the history of generosity of Steve, Judy and Josh Aaron. “The establishment of the foundation now formalizes Birchez ongoing, extensive commitment to the areas our Birches communities serve,” Aaron said. For further information on Birchez Associates, LLC, please visit www.Birchez.com or call 845-331-2097. For information about the Foundation, email kjmcintyre@birchez.com. KINGSTON >> Mayor Steve Noble says he supports a proposed 72-unit senior housing project in Midtown — one of two significant projects expected to come before the city Planning Board next month. The Bruyn Avenue housing project, known as The Cooperage, and a proposal for an indoor shooting range on Prince Street are to be considered by planners when they meet at 6 p.m. Feb. 8 in City Hall, 420 Broadway. Noble said The Cooperage, proposed by Birchez Associates and its managing partner, Steve Aaron, would be a welcome addition to the neighborhood. The Cooperage would occupy the vacant former Kingston Cooperage Co. building where Bruyn Avenue dead-ends at the CSX railroad tracks. The city Planning Board voted unanimously in September 2014 to extend for 18 months the permit granted to Birchez Associates to build the project. Birchez now needs an additional extension, which is why the project is back before the board. The project, estimated to cost at least $16 million, first was proposed in November 2011. The Kingston Cooperage Co. originally was called the Kingston Barrel Corp. and began producing beer barrels in the brick building on Bruyn Avenue in August 1933, just four months before Prohibition ended.